Home Wi-Fi Connection–Pitfalls & Precautions! Wi-Fi has made life so easy for you to use the computer, mobile phones, tablets, portable media players and other wireless devices without the clutter of cables. With everything wired up it’s near to impossible for someone to eat up your bandwidth and keep an eye on you activity. But with Wi-Fi your neighbour might be using your connection or even a person sitting in a car parked outside your apartment. But the dangers are much much bigger than just some clogging your bandwidth – It can land you in a serious soup ! As you may have heard recently, the email that claimed responsibility for the Varanasi blast of Tuesday evening was traced to an unsecured Wi-Fi in Navi Mumbai. A father-son duo was picked up for questioning here in connection with the e-mail sent by banned terror group Indian Mujahideen (IM). Terrorists of Indian Mujahideen have been using unsecured Wi-Fi connections for sending mails to media houses within minutes of blasts taking place. Though both of them were later released after questioning the police came to know that their wi-fi connection was hacked and used to send the email ! 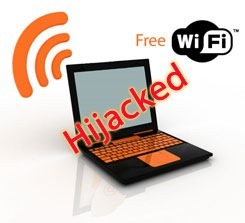 Almost all of us have tried looking for unsecured Wi-Fi connections and jump onto connect. There’s no harm if you are a honest guy looking for some internet connectivity. But if you an owner of an unsecured network, you should be aware that world’s not made up entirely of honest souls like you, and it not difficult to hack into your system and see what EXACTLY you are upto on your network. 1 1) What are WEP and WPA encryption, and which should I use? 5 5) The Most Important: Switch Off you router when not in use! 1) What are WEP and WPA encryption, and which should I use? WPA and WPA2 any day! WEP is easy to crack. The keys used by WPA and WPA2 change dynamically making it nearly impossible to crack (yes, still it can be). WEP is easy to crack (just some packet sniffing and you are done). Guys, it doesn’t mean that you straight away start cracking one (it’s a punishable offence under the cyber law). If you have an old router supporting only WEP then make sure you use the 128-bit WEP keys and keep checking the manufacture’s website for router firmware update. Most WLAN access points and routers automatically (and continually) broadcast the network’s name, or SSID (Service Set Identifier). Turning off SSID broadcast for your network makes it invisible to your neighbours and passers-by (though it will still be detectible by WLAN "sniffers"). You won’t find this feature on all wireless routers and access points, but some allow you lower the power of your WLAN transmitter and thus reduce the range of the signal. Do that by changing the mode of your router to 802.11g (instead of 802.11n or 802.11b) .You can try some desi Indian ways too, by placing the router under the bed, or hide it in a box or wrap foil around the antenna to restrict the signals (Don’t worry it won’t affect your connectivity). The firewall prevents hackers from attacking your network but it won’t restrict the people in you Wi-Fi signal range from getting onto your network. With technology advancing so fast, these days Wi-Fi routers have a range of 150 feet-300 feet. So you need all the above said protective measures. 5) The Most Important: Switch Off you router when not in use! The ultimate in security measures, shutting down your router when not in use! When the bloody thing is not broadcasting the signal, who the hell can break into it? Moreover save it from power cycle wear-and-tear. Switch it off and save electricity. So that’s it. I am sure this would help you getting secured, and saving your bandwidth. You would even save on your bill if u didn’t have an unlimited connection and someone was constantly eating up your download limit. Maybe a few people will start taking security seriously. All Airliners’ Full Fare Sheet goes online! what will be cost to put WiFi in 8 room hotel with one restaurant in Pelling? actually what gadgets are needed to install the WiFi? “Hidding SSID” is a myth. By doing so you make your laptop susceptible to further sophisticated attacks & even otherwise it can cause a connectivity issue in Windows XP if the signal strength is low. Manoj plz tell me total area wich u r using for ur hotel that was main matter in range !!! @Pradeep – Thanks…and yes evryone should ask the installer to set the security and encryption. Yes you must secure your Wifi and if you are not sure ask the prson who is coming to install it and make sure it is secure and switched off when not in use.